Sri Lanka’s economic outlook remains stable with 4.3% growth expected in the medium term, the World Bank said yesterday, but warned that this would only be possible if the Government remains committed to its reform agenda and warned upcoming elections remain the single biggest risk with the window for reform narrowing rapidly. Releasing its latest Development Update, the World Bank advocated the Government should remain committed to the reform agenda aimed at improving competitiveness, governance and public financial management. Together with the International Monetary Fund (IMF) program, these reforms will add to confidence and support fiscal consolidation efforts. “The economy is expected to rebound from a low base and grow around 4.3% in the medium term, driven by private consumption and investment. Inflation will stabilise around mid-single digit level, although the upward trend in oil prices may exert some upward pressure with the implementation of the fuel-price formula. The move towards flexible inflation targeting will help keep inflation in the single digits, while the exchange rate is left to adjust to market forces,” the report said. “The challenging political environment has already slowed the reform agenda and remains the key risk to a favourable medium-term outlook. 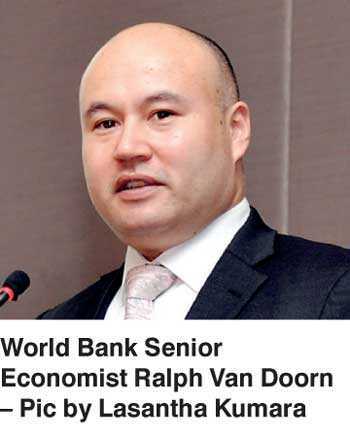 With the impending election cycle, which elevates this risk, the window for further reforms is narrowing,” said World Bank World Bank’s Senior Economist Ralph Van Doorn. “Sri Lanka’s march towards upper middle-income status and more and better jobs hinges on the economy’s competitiveness and its ability to pursue a private investment-tradable sector-led growth model,” he added. He praised the Government for introducing several key reforms, including the new Inland Revenue Act (IRA), transparent fuel pricing formula, drafting of a new Public Finance Act and implementation of a single window for investors. However, some other vital reforms were lagging. These include passing of the Audit Act, progressing on establishing a unified debt management office, SOE reforms, and reforms to improve the investment climate such as the legislation on Secured Transaction Registry, the Customs Ordinance and revisiting the Companies Act. Albeit small, the Government recorded a primary surplus in 2017, in line with the IMF-supported government program. The achievement that came as a first-in-decades was thanks to improved tax collection and controlled non-interest current expenditures, the report said. “Nevertheless, a sharp increase in interest expenditure led to a marginal increase in overall deficit as share of GDP to 5.5% in 2017. Fiscal risks emanating from public debt (77.4% of GDP, 2017) and Treasury guarantees issued mainly for SOEs and State agencies (6.8% of GDP, 2017) remained high in 2017 as well. “On the fiscal and debt management front, risks include the delay in implementing revenue measures, slower than expected improvement in tax administration, and delays in implementing the Active Liability Management Act. The increasing occurrence and impact of natural disasters could have an adverse impact on growth, the fiscal budget, the external sector and poverty reduction,” the report said. External risks include disappointing growth in key countries that generate foreign exchange inflows to Sri Lanka: exports, tourism, remittances, FDI, and other financing flows. Tighter-than-expected global financial conditions would increase the cost of debt and make rolling over the maturing Eurobonds from 2019 more difficult. However, the Active Liability Management Act will help mitigate this refinancing risk. Faster-than-expected rises in commodity prices would increase pressure on the balance of payments and could make further fuel price reforms more difficult. Sri Lanka faces a number of challenges to sustain future economic growth, create more and better jobs and reduce poverty which must be addressed through determined reforms. These challenges can be addressed through four sets of priority reforms, according to the report. The first is staying on the fiscal consolidation path and creating fiscal space for health, education, social protection and other public investments. Second, improving Sri Lanka’s competitiveness and promoting trade and FDI to facilitate a shift in the growth model, driven more by private investment and exports. Third, making progress on and completing the already started governance reforms such as Right to Information, the Audit Act and the Public Finance Act and SOE reforms. On reducing vulnerability and risks in the economy, the report comments on managing refinancing risks of Eurobonds beyond; improving the debt management function with requisite institutional, legal and strategy frameworks; mitigating the impact of reforms on the poor by replacing untargeted effective subsidies to the non-poor by targeted spending; and enhancing the country’s resilience and disaster preparedness to deal with frequent natural disasters more pro-actively. These key challenges are interlinked and require a comprehensive and coordinated approach. Although domestic political considerations and institutional constraints on policy implementation make it challenging, a strong political will and support of the bureaucracy could help advance the reform agenda. Steps are needed to ensure the support of the private sector, civil society and other stakeholders through improved communications on costs and benefits of its Vision 2025 agenda, the report emphasised.